We recommend using 10% by volume of biochar blend. 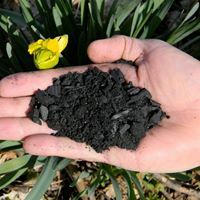 Spread 1/2″ of Soil Reef Biochar blend over the surface of your garden area and till in 5″ deep. A one cubic foot bag of Soil Reef Biochar Blend will cover approximately 24 square feet at this application rate. Feel free to experiment with adding more or less to your soil.. Since Soil Reef is a permanent soil amendment, one application can last a lifetime. However, additional, cumulative benefits can be seen by adding it year after year. The choice is up to you.